VATICAN CITY (CNS) — Pope Francis is leading the Catholic Church on an extraordinary campaign to prevent President Barack Obama’s proposed military strike on Syria. On Sept. 4, the pope appealed to leaders of the G-20 nations to “lay aside the futile pursuit of a military solution” to the Syrian civil war and promote instead a “peaceful solution through dialogue and negotiation.” The next day, his foreign minister sent the same message in a special meeting with the Vatican diplomatic corps. And on Sept. 7, the pope was scheduled to lead a prayer vigil for Syria in St. Peter’s Square — an event that the Vatican spokesman, Jesuit Father Federico Lombardi, said would be unprecedented, in both scale and importance of setting, as a papal gesture for peace. Exceptional as they are, however, Pope Francis’ actions have followed in close continuity with the spirit and record of his predecessors. 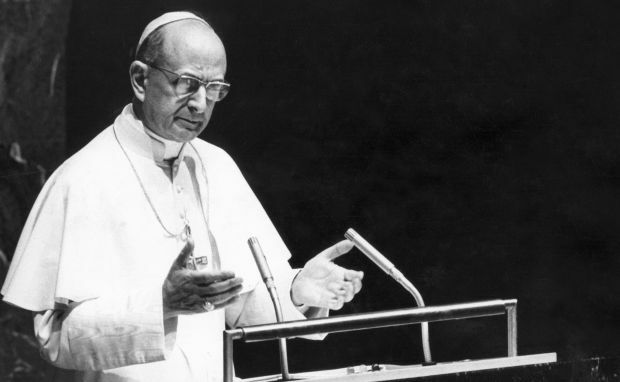 On the first visit by a pope to the United Nations, in 1965, Pope Paul VI memorably called for “No more war, war never again.” Blessed John Paul II was a constant campaigner for peace, calling the interfaith meetings in Assisi, praying for an end to violence in the Balkans, and doing everything he could, publicly and privately, to prevent the 2003 invasion of Iraq. Papal peacemaking efforts have yielded little in the way of concrete results — the major exception being the Vatican’s mediation of a territorial dispute between Argentina and Chile in the late 1970s and early 1980s — but no office today is more closely identified, by Catholics and non-Catholics alike, with promotion of peace as a fundamental value. Yet that role is a relatively recent one in the context of the papacy’s 2,000-year history. Until a few generations ago, far from tirelessly advocating for negotiation and dialogue, popes often justified war and even waged it themselves. Most famously, a series of medieval popes called Crusades against Muslims in the Holy Land and elsewhere in the region — including Syria. Until the late 19th century, the papacy had its own army, the last vestiges of which are visible today in Vatican City’s colorfully uniformed Swiss Guards, whose job is no longer to attack anyone, only to protect the pope. But in the early 16th century, the Renaissance Pope Julius II actually rode at the head of his troops, wearing full armor, in battles against rival Italian rulers and France. It was only in the 20th century that the bishop of Rome emerged as a reliable voice against war as a way of resolving international disputes. Pope Benedict XV made extensive efforts to broker an end to the carnage of World War I, and Pope Pius XII sought through diplomatic channels to head off World War II. That change certainly reflects the vast leap in destructive power of military technology in the industrial age, which has made the conditions set by Catholic social teaching for waging a just war all but impossible to meet. In 1963, Blessed John XXIII wrote in his encyclical “Pacem in Terris” that nuclear weapons had made war finally unacceptable as a means of redressing injustice. And Pope Francis, while opposing military intervention in Syria, has stressed that he condemns with “utmost firmness” any use of chemical weapons, a recent instance of which is Obama’s justification for striking the forces of Syrian President Bashar Assad. Not only the nature of modern weaponry, but also a change in the papacy itself has made it easier for popes to give up on war. With the loss of the Papal States in 1870, the Holy See ceased to be a territorial power. Since then, no pontiff has had a direct stake in any international conflict, and this neutrality has left popes freer to fulfill their role as leaders of a truly universal church, including the fundamental role of making peace.